Welcome to District 12: Mockingjay Part 1 Countdown: REENACTMENT!! We are at the end of our Countdown series, you guys! We stopped at Chapter 12 because we believe that is where Mockingjay Part 1 will be split. 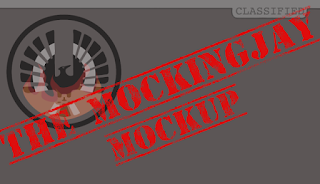 If analysis is your thing, feel free to check out our Mockingjay Mockup series which we wrote a couple years ago to convince fans why Mockingjay should be split and how. Now lets get on with it. So what happens in Chapter 12? Mainly, Katniss and Finnick are killing time while they wait for the results of the Peeta rescue mission. We have reason to believe that this sequence will be the climax of Mockingjay Part 1, along with the propo the rest of the rebels are filming around the same time as the mission starts. In just a few days we will be seeing Sam Claflin portray the real character of Finnick Odair, particularly in this scene. Finnick divulges his troubling secrets for all of Panem to hear, and I can't help but be excited to actually see President Snow's reaction. One of the things I've enjoyed the most out of seeing the films bring the books to life is the ability for the focus to be changed. Due to the nature of filmmaking we have been able to see what is happening behind closed doors in The Capitol while the main storyline is going on. I am crossing my fingers that not only do we see Finnick's secrets being aired on Snow's television (or hologram or whatever he's got) but also across Panem. What are the citizen's reactions to such atrocities? Will this event change the minds of citizens on the fence about the rebellion? I guess we will find out next week! When the mission is a success, there is a reunion of sorts that is very happy: Finnick and Annie. I have a feeling they will really play up the joy of seeing a reunion like this only for the rug to be stolen away from under the movie goers. SUPRISE!! PEETA'S A RAVING LUNATIC!! Now I could be wrong and Francis could have chosen a different path for the end of Part 1 completely. But for years this is how I have felt they would end Part 1. 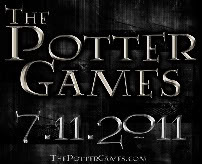 Hopefully, it doesn't end too abruptly because I am already DYING to see Johanna. If I only see her roll by on a gurney I swear I will scream right there in the theatre. So what's with the weird video? Well Tiffany and I (Courtney), wanted our Mockingjay Countdown to go out with a bang. We decided to reenact, as ridiculous as possible, that awful moment that every fan is dreading to see on the screen. The only way for us to cope with this intensity is to laugh at it, so there it is. We hope you have enjoyed our Mockingjay Mockup posts, but more importantly we hoped you guys enjoyed our creations week to week. We wish everyone a happy film release, be safe, and have an awesome time!! Be sure to tweet us your pics next week! !